Node.js solution for running mocha-based selenium-webdriver tests. 1. Add a script to package.json. E.g. "nemo": "nemo -B test/functional"
3. Run nemo! "npm run nemo"
Use the "complex scaffold" feature (-Z) to create a suite with this option. If using a plain JS/JSON file, you can add it as nemo.config.json or nemo.config.js in the directory you run nemo from. Then you can run nemo simply as ./node_modules/.bin/nemo. Nemo will find your configuration file automatically. You can also specify a differently named or placed file using the -C option as ./node_modules/.bin/nemo -C path/to/config/config.js. Use the "basic scaffold" feature (-X) to create a suite with this option. This convenience setting will create timestamped and tag-based directory structure for reports and screenshots when you use mochawesome or xunit reporters. When you use this, you can omit the specific directory/filename settings for those reporters, as nemo will take care of that for you. Recommended to set this as path:report, which will create a report directory beneath your base directory. See Reporting below. 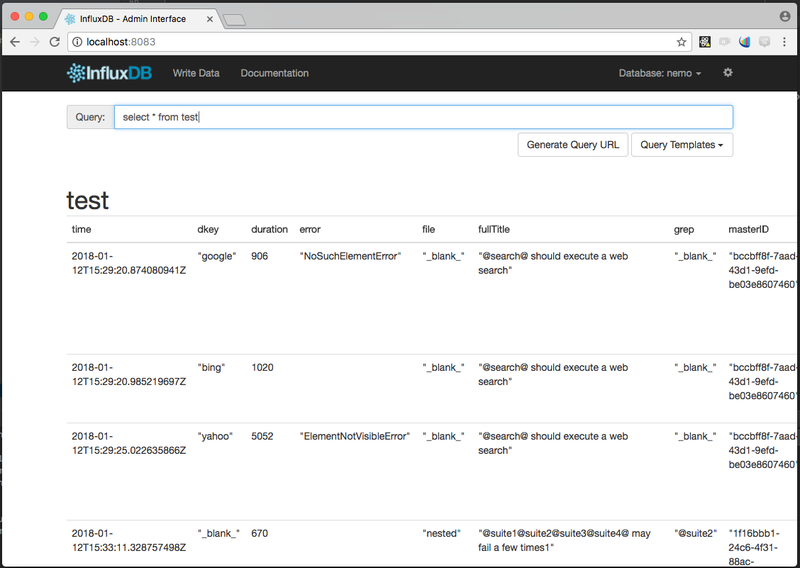 You can provide an influxdb endpoint and store test results in it. E.g. any environment variables you want in the test process. currently base.env is only honored if nemo is launching parallel nemo instances (each as its own process). If nemo launches a single nemo instance in the main process, these are ignored. If you use either of the built-in reporters (xunit or mochawesome), nemo will generate timestamped directories for each run. The reports will be further separated based on the parallel options. E.g. In the above example, parallel options were "profile", "file", and "data". You can use nemo.snap() at any point in a test, to grab a screenshot. These screenshots will be named based on the respective test name, and number of screenshots taken using nemo.snap(). E.g. If you use the mochawesome reporter, you will see these screeshots in the Additional Context section of the html report. 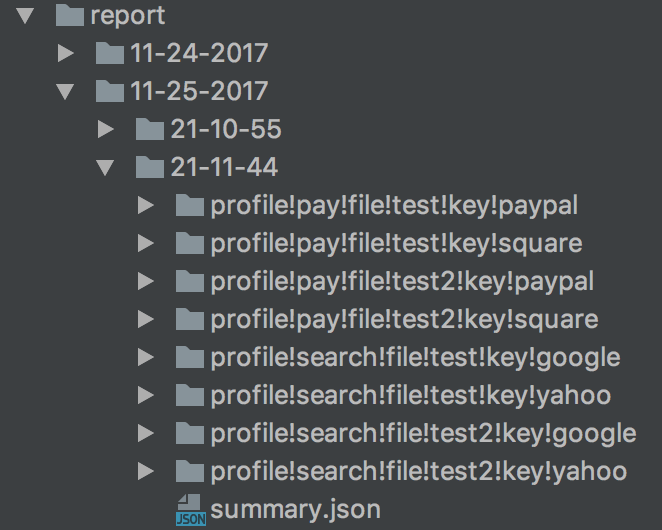 If you are using mochawesome or xunit along with the output.reports setting, screenshots will be placed in the appropriate output directory based on the instance details of the test which generated them. nemo injects a nemo instance into the Mocha context (for it, before, after, etc functions) which can be accessed by this.nemo within the test suites. nemo also adds the current test's context to nemo.mocha. That can be useful if you want to access or modify the test's context from within a nemo plugin. nemo will execute in parallel -P (profile) x -G (grep) mocha instances. The example above uses "browser" as the profile dimension and suite name as the "grep" dimension. Giving 2x2=4 parallel executions. In addition to profile and grep, are the dimensions file and data. file will multiply the existing # of instances by the # of files selected by your configuration. data will multiply the existing # of instances by the # of keys found under profiles.base.data. It can also be overriden per-profile. It will also replace nemo.data with the value of each keyed object. In other words, you can use this to do parallel, data-driven testing. Using a reporter which gives file output will be the most beneficial. nemo comes out of the box, ready to use mochawesome or xunit for outputting a report per parallel instance. nemo creates mocha instances programmatically. Unfortunately, not all mocha command line options are available when instantiating it this way. One of the arguments that is not supported is the --require flag, which useful if you want to require a module, e.g. babel-register for transpilation. Thus, we added a "require" property in config.json, which takes a string of a single npm module name, or an array of npm module names. If it is an array, nemo will require each one before instantiating the mocha instances. Nemo publishes lifecycle events which can help to monitor progress. Published when an instance starts. The event is an object. Published when an instance ends. The event is an InstanceResult object. This event is published when all instances are completed. The event is an array of InstanceResult objects. This event is published at the conclusion of a test. The event is an object. You can use "uid" to correlate this event with other test events from the same instance. Please note: When using the driverPerTest option, there will be no nemo instance in the before/after lifecycle context. Custom arguments can be useful for programmatically customizing Nemo configuration.